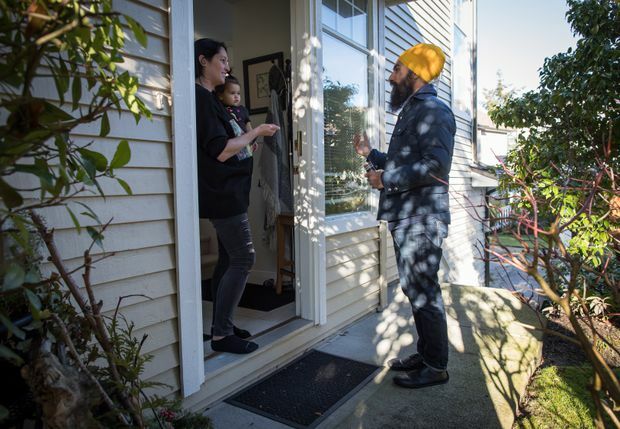 NDP Leader Jagmeet Singh talks with Adrienne Vawda as she holds her daughter Anika Vawda, 1, while door-knocking for his by-election campaign in Burnaby, B.C., on Saturday. Jane Hilderman is executive director of The Samara Centre for Democracy. Paul E.J. Thomas is senior research associate. Canadians pride themselves on having an electoral system largely free from partisan political manipulation. But in recent months, the federal Liberal government has been accused of intentionally delaying a B.C. by-election in the Burnaby South riding to hinder NDP leader Jagmeet Singh’s efforts to win a parliamentary seat. While that by-election date is now set, questions remain over whether the government should be able to decide how long communities go without representation. Canada’s by-election system allows seats to stand empty for a uniquely long time. According to research by the Samara Centre for Democracy, since the 1997 election, it’s taken 148 days on average to fill each vacancy to the House of Commons. In the United Kingdom, the average over the same period was just 53 days – and no British seat went more than 150 days without an MP. Despite adopting fixed dates for general elections, the government maintains wide discretion over the timing of by-elections. The law requires only that by-elections are called between 11 and 180 days after the Commons’ Speaker officially recognizes a vacancy, and that the campaigns are at least 36 days long. By-elections can therefore occur within 50 days of seats becoming vacant. But most take far longer, with governments of all political stripes often taking well into the 180-day period to call the votes or extending the campaigns beyond 36 days. For example, the previous Conservative government used both methods to avoid a by-election in Peterborough after MP Dean Del Mastro was convicted of violating election spending limits. The government waited until the last possible moment to call the by-election and then set the vote for the same date as the 2015 general election. In the end, the riding went 348 days without an elected representative. The Liberal government’s recent election law reforms should improve matters somewhat by limiting by-election campaigns to a maximum of 50 days. However, the 180-period for calling by-elections remains unchanged, and the new measures would also prohibit by-elections for vacancies that occur within nine months of a general election, potentially leaving communities without representation for an extended period. MPs are a cornerstone of Canadian democracy and do far more than simply vote on legislation. In a minority situation, it is the balance of MPs between parties that determines whether a government will remain in power. MPs also spend much of their time helping constituents access government services. When a seat becomes vacant, the constituency office can remain open under the direction of the whip from the former MP’s party. However, these staffers cannot hope to be as effective in advocating for citizens without a dedicated MP to push cases forward with the bureaucracy. Moreover, MPs serve to represent the Canadian government to their communities, presiding over Canada Day celebrations, Remembrance Day ceremonies, and dozens of other events each year – a symbolic role that staff cannot fill. There may be practical reasons why Canadian by-elections take longer to organize than those in the U.K. However, the current difference in the average length of time that citizens are left without representation cannot be justified. A private members’ bill introduced by MP Nathan Cullen would cut the maximum time for calling a by-election to 45 days from 180. While it would be a positive step, this reform would still allow governments to delay by-elections for more than a month to suit their own ends. The dates for general elections are now fixed to prevent governments from timing the votes for their own advantage. It’s time we did the same for by-elections. After all, almost 1.8 million Canadians across 18 ridings have gone without an MP in the 42nd Parliament so far. Canada's democracy can and must do better. Canadian law should be amended to ensure that by-elections occur a fixed number of days after a vacancy, with safeguards to avoid votes falling on major holidays. While the exact number should be set in consultations with Elections Canada, we believe bringing Canada closer to Britain’s practice, which sees most seats filled within 60 days, is a reasonable goal. Until such changes are made, the timing of by-elections in Canada will continue to reflect what is politically best for the government of the day rather than citizens’ need for effective representation.